Waimate district’s rich agricultural history is celebrated by the iconic White Horse on the hill overlooking the town and coastal farmlands. The site is easily accessible by car, on foot, or mountain bike, and is a fantastic spot to take in the views east to the Pacific Ocean, and west to the mountains. Built in 1968, the white horse is also a testament to one man’s dream and determination. Retired farmer Norman Hayman returned from a European holiday inspired by a Friesian cow statue in Holland. He reckoned that the Clydesdale horse deserved a similar tribute for its contribution. During the 1960s a Development Society was formed in Waimate to promote industry and holiday attractions in the district. Local farmer Jack Sutherland, of Centrewood, gave 10ha to the Waimate Development Society for a look-out and park overlooking the town. Norman put forward his suggestion for a Clydesdale horse statue, but the cost was too high. Two year old colt - Crown Royal. NZ. Centrewood Estate. In his own words, from notes he made at the time, Norman wrote: ’I then came up with a plan of a silhouette, twice the size of a horse, in a concrete slab on its edge. There was still doubt about the size being sufficient. Time was going on and no monument. It took Norman and his wife, Betty, three months to lay 1220 concrete slabs. The 2.5 ton head was precast in Ron Hutt’s yard. The final cost was $240, met by donations from ‘old time’ farmers, teamsters, and others who admired the Clydesdale horse. Norman’s experience with horse teams began on his parents’ farm during his early school days at Studholme. He left school at 15 to work on the farm. ‘I had to get up at 5.30 in the morning and bring the horses in to give them two hours of solid feeding and grooming. Then at eight o’clock sharp the chains were tightened and work began until noon. 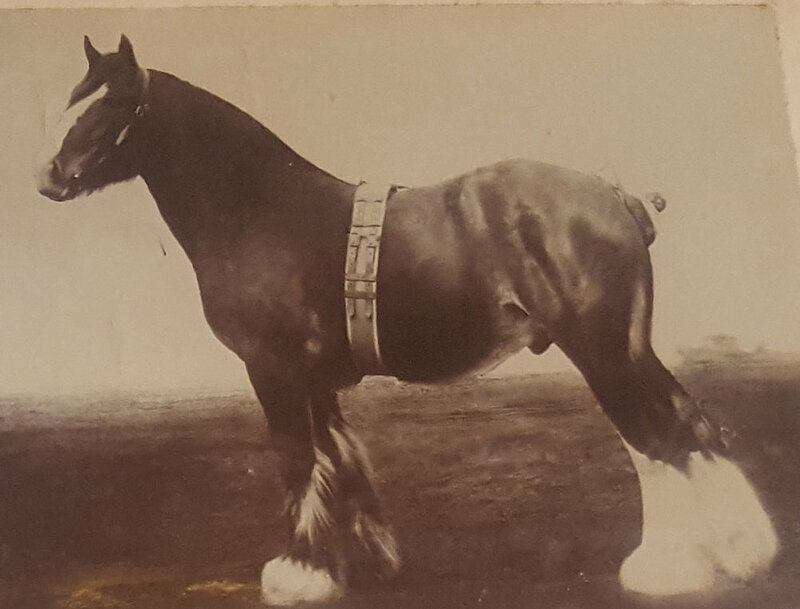 Norman’s research with the Ministry of Agriculture, showed that Clydesdales were well - established in the Waimate district before 1900. By 1918, the peak year of the working horse population there were 351,544 draught horses in New Zealand - 8,233 of them in Waimate district. By 1921 the number had dropped to 319,034. But by 1965 - 66 the tractor had taken over completely, and no draught horses were listed. Norman died in 1988, and his contribution to the district through this iconic memorial will always be remembered. There are two options for walking, both require a good level of fitness, or just take it slowly and stop when you need. You can hike up to the horse on the Studholmes Bush walking track, starting at the main carpark at the entrance to Waimate Gorge - it’s a three - four hour return trip, depending on your fitness. It's a long steep climb at the start, rewarded by amazing views at the top. The walk from the top of Studholmes Bush hill to the White Horse look out is reasonably flat, with a rise at the end. Again, the views from the top looking over the town, out to sea and up the coast are worth the walk. The other way is to walk up from the White Horse carpark at the top of Point Bush Road, via the shared use Big Easy trails. Keep an eye out for mountain bikers and runners who also use the tracks. Mountain bike up the Big Easy trail. A 20 minute drive, signposted from the intersection of Mill Road and Queen Street, Waimate.